Regret to inform that the Workshop have been postponed to 15 January 2015. Mr. Zen Chow, Executive Director of KK Chow Tax Services Sdn Bhd graduated from Monash University with a Bachelor of Business and Commerce - double major in Accounting & Banking and Finance after spending a year in Melbourne, Australia. Mr. Zen Chow has been in the taxation industry since year 2005. He now holds the position of Executive Director as well as the head of tax department in K K Chow Tax Services Sdn Bhd. He specialises in both direct and indirect Malaysian taxation. He has been involved in the tax compliance and tax advisory works for various industries ranging from agriculture, franchisor/licensor, investment holding, investment dealing, forestation, manufactur¬ing, education, trading (retail & business services), foundation, association and trade union.He is a Chartered Accountant by pro¬fession after admission as a qualified member of the Malaysian Institute of Accountants. He also became an associate member of the Chartered Tax Institute of Malaysia (CTIM). He is currently a member of the Continuing Professional Development (CPD) committee in the CTIM. 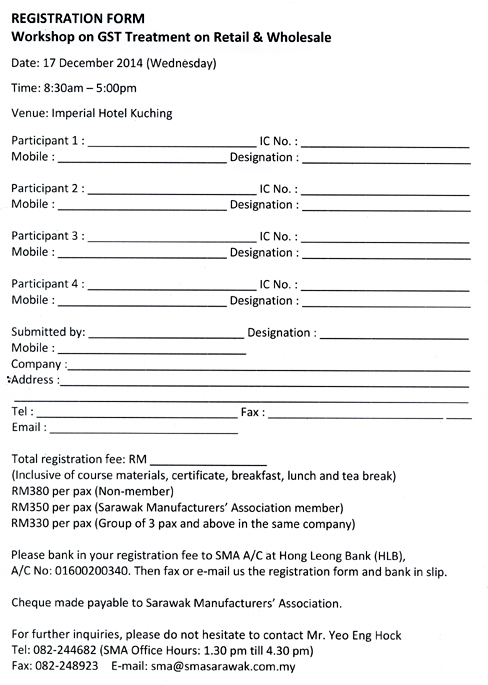 Cheque made payable to Sarawak Manufacturers’ Association.